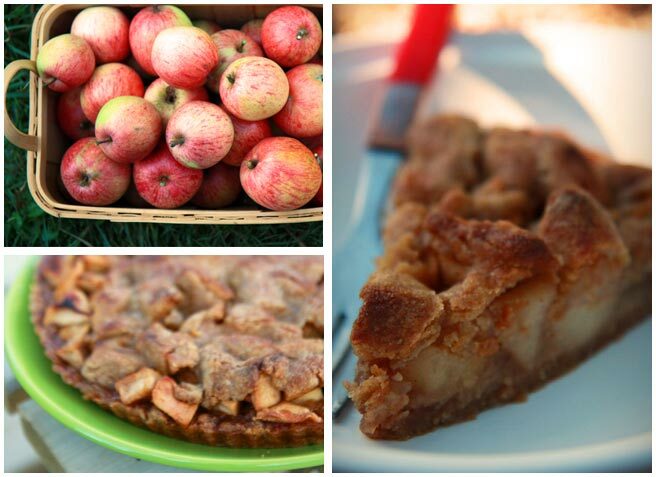 Apples from our tree at the house in the country and my current favorite apple pie, recipe below. In addition to the yield from our apple tree this year, neighbors came bearing baskets full of apples. Time to take out my country notes and get the creative juices flowing. Forthwith one hundred and twenty one ideas from French market menus, followed by my current favorite apple pie recipe. We've got guests coming this weekend. Lets roll up our sleeves and get to peeling apples! Lobster seasoned with sherry and cocoa, served with an apple raisin "afterthought"
Now. Did that give you some ideas? -Peel, core and cut your tart cooking apples into chunks. -Take a generous handful of the chunks of apple and toss them in a saucepan with about a 1/4 cup of water. Set them over medium heat to soften. -Combine the rest of the apple chunks with 50 grams white, 50 grams brown sugar and the cinnamon in a bowl and set aside. -Once the apples cooking in water have softened (about 5 minutes), give them a blitz with a blender to turn them into a puree. - In a separate mixing bowl, Combine the butter and flour with your fingers in a large bowl until it resembles breadcrumbs. -Add the sugars, and work them in. -Finally work in the cheese and the walnut oil and press it together into a dough. -Remove approximately 1/4 of the dough, form it into a ball, flatten it, and place it in the refrigerator. -Press the rest of the dough with your fingers rather thickly in an even layer into the bottom of an ungreased pie tin. Don't press it too high along the sides, just a flat layer at the bottom,a little thicker around the edges. Pre-bake the shell at 400F/200C for 10-15 minutes, or until the dough begins to turn a golden brown. -Slather the bottom of the pre-baked shell with the apple puree. -Top with the apple sugar cinnamon mix, mounding it up in a nice thick layer. -Remove the chilling dough from the refrigerator, and roll out a circle shape about 2 inches smaller than the pie shell. No need to get too fastidious about the shape. Turn the thin layer of raw dough onto the center of the mound of apples. When you bake it, it will kind of melt into the apples before hardening into a cookie crust on top. - Cover the pie with foil, and bake in the hot oven for about 40 minutes, until the apples get nice and soft. - Remove the foil and return it to the oven to brown and crispen on top. This looks divine - I've been looking for a good use for my freshly-milled whole wheat flour, although, ironically, I have no apples. They're the only thing I'm lacking and I can get them easily enough - thanks! My dear, you could write an entire blog about scrumptious apple recipes. Many of these mentions spark my fancy. At the moment though, the buckwheat blinis served with warm apples would serve much delight. I hope you like the tarte, Sinda. Oh yes, those buckwheat blinis sound divine don't they. I think I'll go looking for a recipe immediately. In mulling over this list, I see a lot of apple being put together with pears. Apple & pear tarte tatin, crumble, crisp, clafoutis, "marmelades", etc. That's also something to try. - hope to see you there! Black pudding with apples wins ! Baked apple comes a close second though . I have to go through this list later but I had been thinking of a decidedly nonFrench idea -- apple, cinnamon and vanilla risotto. It's a sweet risotto, very close to rice pudding but not quite. Great list of ideas, Lucy!! BTW - I made your apple tart last night, with minor-minor changes. Pretty delicious!! goodness what a list! but they are wonderful to cook and play with! Whew! That's a lot of apples. But goodness, what wonderful, dreamy dishes! Wow, what a lot of apple ideas! That recipe sounds good. I'll have to try it! where does one start?The apple tart is a good place. Thanks for all the delicious suggestions! this list is amazing! you must've spent hours on it. now i just gott get myself some apples. you could also add christmas mince meat filling to that list (my british husband just made some to sit for a few weeks!). I baked and ruined two apples pies in the last week...but this recipe and seductive photo have raised my morale again. I'm going to throw out my latest apple disaster and try it.